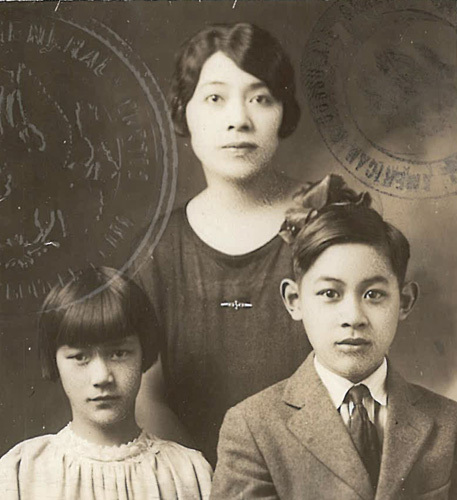 “Portraits of Seto More Fannie and family” 1921, 1924, 1927, 1933, Chinese Exclusion Act case files, RG 85, National Archives-Seattle, Seto More Fannie (alias Lew Tue Fannie) case file, Seattle Box 787,file 7030/12060. 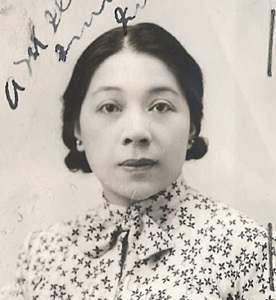 Fannie Seto More (Lew Tue or Lew York Lue) was born on 9 July 1890 in Olympia, Washington. In 1913 she married Seto More; a Canadian citizen and a Canadian Pacific Railways passenger agent. Because Fannie married a Canadian citizen she lost her U.S. citizenship. 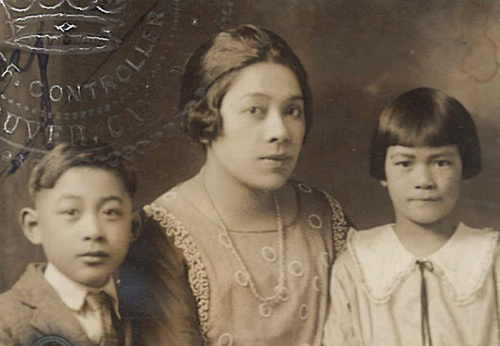 When she traveled to the U.S. from her home in Vancouver, B. C. her classification under the Chinese exclusion laws was “traveler.” Her two children, Wilfred and Maysien were both born in Vancouver. Wilfred Bientang Seto was born 21 August 1915 and Maysien Geraldine Seto was born 30 April 1918. The three traveled from Vancouver to Blaine, Washington via train many times, had Canadian certificates of identity, and became well known to immigration officials. Fannie’s file starts in 1909 and covers her many trips between Vancouver, B. C. and Seattle, WA until 1940. The following is some of the information gleaned from her file. Her parents were Lew King and Lee Shee. She had three brothers and one sister; Lew Geate Kay, Lew Get Soon, Lew Get Don, and Lew York Lon, (Mrs. Tom Shue Wing). Lew King, a member of Jong King Company and Wah Hing Company in Seattle, died in August 1908. Her mother, Lee Shee, was born in Kin Ham village, Sunning district. She was admitted to the U.S. in 1873 as the wife of a merchant about seven months after she married Lew King. She died in Seattle in 1914. 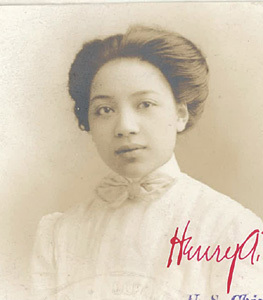 In 1909 Fannie was traveling from Seattle with student status. Her mother, Lee Shee, and brother, Lew York Lon, were witnesses for her. Lee Shee testified that she and her husband moved to Seattle in 1883. Seven months after they arrived, someone set fire to their store on old Third Avenue South. They moved nearby to the apartment above Hong Yee Chung Company store and stayed there until the Great Fire of Seattle in 1889. After the fire they lived in Olympia for a few years until they returned to Seattle. 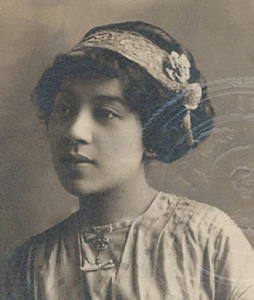 S. L. Crawford was a Caucasian witness for Fannie Seto More in 1909. He testified that he had been living in Seattle for thirty-four years [since 1875]. Crawford was a reporter for the Post Intelligencer during the Chinese riots in 1886 and city editor for many years. He had frequent dealings with Lew King and knew him intimately. Lew King had been a Chinese interpreter for the court when Judge Lind was on the bench. [Judge Lind was a Thurston County judge in the early 1900s] Crawford identified photos of Lew King’s children including the applicant. Witness Louie Kay, also known as Yin Lim and Hong Po, testified that he was a member of the Lew family but not related to Lew King. He came to Seattle in 1879; was away for the riots; and came back about two months after the 1889 fire. He was questioned about many things concerning the extended Lew family but most of the information did not pertain to Fannie. A 1921 letter from Frederick M. Ryan of the American Consular Service in Vancouver, B.C. confirmed that Mrs. Fannie Seto More acquired British citizenship through the naturalization of her husband. “Seto More Fannie passport visa” 1927, Chinese Exclusion Act case files, RG 85, National Archives-Seattle, Seto More Fannie (alias Lew Tue Fannie) case file, Seattle Box 787,file 7030/12060. 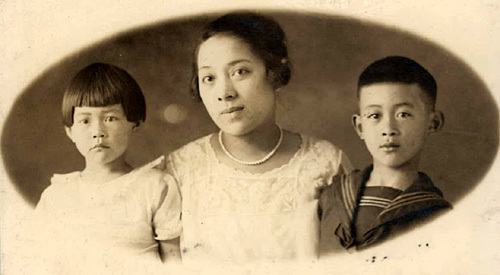 In 1921 Fannie and her children were issued Section 6 certificates by the Controller of Chinese Immigration in Vancouver, B.C. John J. Forester, of Vancouver, swore in a 1927 affidavit that he knew Fannie Seto More and her children and could identify them. By 1933 Mr. Seto More was manager of the Chinese Department of the Canadian Pacific Railways in Vancouver. 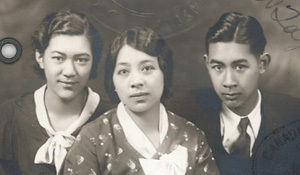 In 1938 Fannie was traveling to visit her brother, Lew G. Kay, a staff member of the Chinese Consulate in Seattle, and stopover in Oakland, California to see her sister. 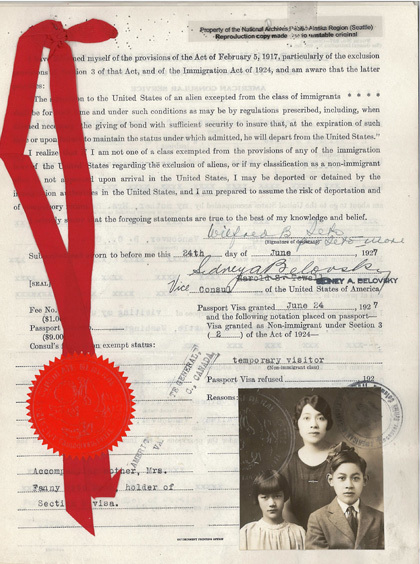 “Seto More Fannie Form 430 photo, Consular photo, Admittance photo” 1909, 1914, 1938, Chinese Exclusion Act case files, RG 85, National Archives-Seattle, Seto More Fannie (alias Lew Tue Fannie) case file, Seattle Box 787,file 7030/12060. The file ends with Fannie’s and her daughter’s visit to Seattle in February 1939.